A statue of Rudyard Kipling has been commissioned subject to the funding being raised by public donation. 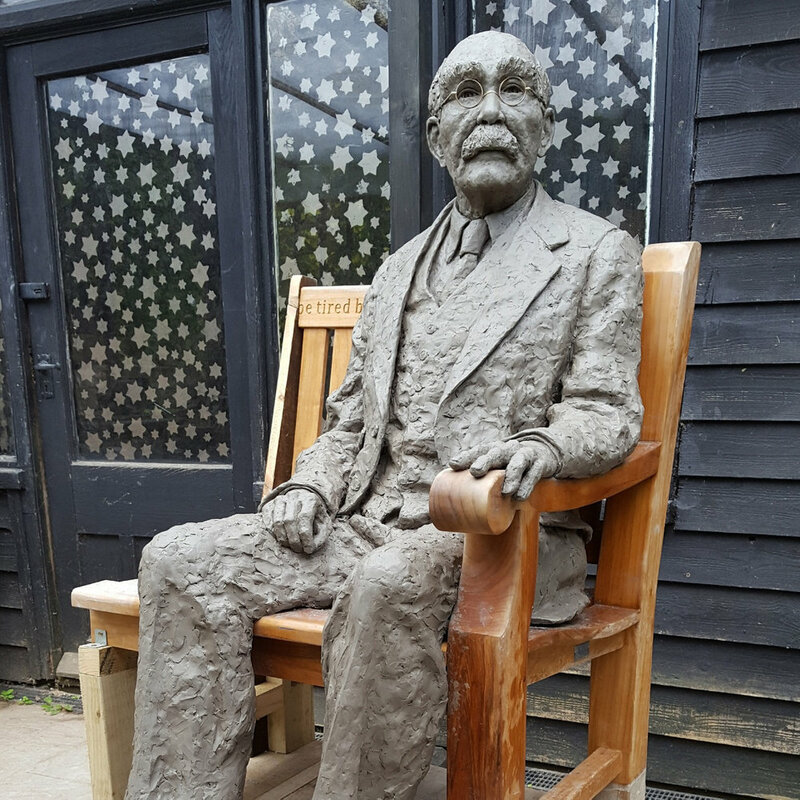 It will show Rudyard Kipling seated on a bench and will be located prominently in Burwash High Street. Both the statue and the bench will be cast in bronze. This will celebrate the work of Kipling and also encourage more of the many visitors to Batemans to come into the wonderful village itself. It is hoped that the increased footfall will help to sustain all the existing businesses and employment. The following is a diary of the day-to-day process of creating the Kipling sculpture. Updates will happen at regular intervals and hopefully you will get a sense of the development from beginning to end. The first step, after finding the right model to sit as Kipling, was to make the armature. It's always very tense trying to make sure it’s exactly right. It's getting there. Measuring and re-measuring again. Had to tilt the body up with wedges to raise the shoulders away from the back. Started putting the clay on and I've now got something to work with. After a few days of applying the clay and sculpting, Kipling has started to appear. Leaving it to dry out as well as working on making the head right. My brilliant and patient model Nick has been sitting for me so I can get the body shape and pose of Kipling just right. This day was mainly spent faffing around with the trouser legs. Still not right and very frustrating. (Photo by Ann Chown). Concentrated on the head today. Got Kipling’s hat size and had to reduce his head down quite a bit. Then realised the body was just too big, so …. Arms off! Bulked out legs too. A long day today. Having worked on the sleeves, at the end of the day I realised the arms are too long now! There was nothing else for it. I had to do them again. Another long day. I'm happy with the progress. I think it’s getting there. The glasses definitely help with bringing the character out. I can see Kipling clearly now. Changed the arms again! I needed help and got it from a lovely group of friends. Amy from Batemans, Mary Clarke and Claire Walford, Philippa Evans and family… great help, especially Mary. Mainly head work today. Still not sure about the shoulders. Looking forward to getting feedback from John Walker of the Kipling society who is visiting soon. Today was also spent working on the feet and getting the shoes just right. You can see the before and after in the image above. Big day today. I received the seal of approval for the sculpture from John Walker of the Kipling Society. Approved by Kipling Society, Batemans and Parish Council. Phew! He was also really helpful and said that Kipling had sloping shoulders – changed now and I feel much better. I wasn't happy with the head as it was too big. I reduced it in size and I'm so much happier with it. Also made the glasses wider and took the lenses out - what a difference! The final stages of the process. Casting with the boys from Athens.I was allowed to help with the mould making and learnt so much from the professionals. Very nearly there. Watching the team remove the moulds was both exciting and slightly nerve wracking. Always great to witness these experts at work. Next stop Athens. A fascinating vision of Kipling in pink wax pieces! The statue is being cast in bronze in Athens. Using the traditional lost wax process, it will be cast in sections and then put together and patinated there. Can’t wait to see it all put together. Foundry VPtassis Panagiwths Tassis in Athens are doing a wonderful job. The excellent video below shows the first glimpse of Kipling in bronze. Here are some of the images taken from an amazing video on facebook. Arrived ahead of schedule is the portrait head of Kipling. What a great job VP Tassis have done with the casting. In addition to the unique statue, there will be an edition of 8 portrait heads available. I’ve just returned from Athens and the boys at VP Tassis have done an amazing job. Thank you. Mr K should be coming home mid-October, although we still haven’t got a date for the grand unveiling! Please check back here for more details nearer the time. 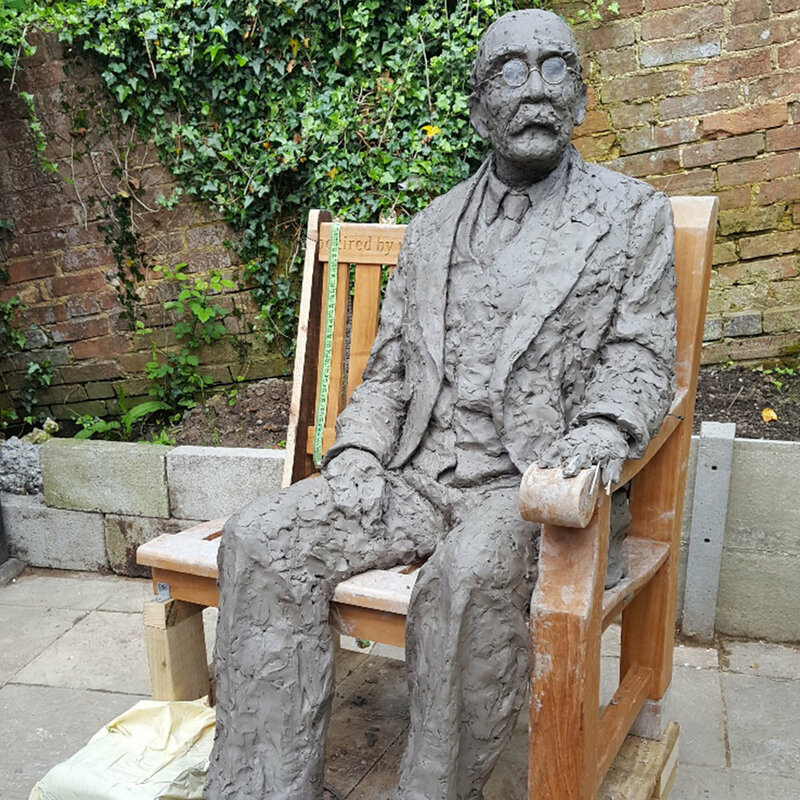 The unveiling is going to take place soon, so Rudyard Kipling will be there for all to see on Burwash High Street from Saturday, 16th February onwards. Thank you Ann Chown for the lovely photographs. A few thank you's to the hard working members of the team. I couldn't have done it without you all. Chris Hesketh supplied all the clay. Peter (my wonderful husband!) made the armature, modelling stands and a lot more! !